Clonmel Theatre Guild has been entertaining Clonmel audiences with high quality theatre productions since 1969. We currently stage two and sometimes three plays per year, which prove hugely popular with the hundreds of people who come to see them. Clonmel Theatre Guild embodies the spirit of local talent coming together to bring to life the works of both modern and acclaimed playwrights. The Guild has delighted art lovers everywhere throughout Clonmel and its environs with well-established works and has staged over 110 productions in the past 45 years. 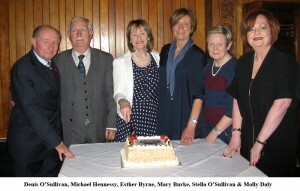 Clonmel Theatre Guild is a well-established, vibrant amateur society. Its main objective is to bring ‘The Theatre’ to the town of Clonmel and environs with a varied programme of drama. The most important part of any drama group is its members, and we are blessed with a group of people that are willing to work hard and give up their free time to bring their experience and talent both behind and to the front of the stage. We are also blessed to still have older members waiting in the wings always ready to give advice and support where needed. Their vast wealth of experience is priceless and always welcomed. We as a guild are always delighted to welcome new members and recognise that for survival a blend of old and new is vital. Our members come from all walks of life, are all shapes and sizes and are aged from 16 to over 65. The Guild has been fortunate that throughout our history we have had tremendous support from the people of Clonmel and surrounding districts. The task of putting on a production can be hard and demanding but the reward of your applause, encouragement and support has been vital to our efforts for this we thank you. Clonmel Theatre Guild is a member of the Drama League of Ireland. The Guild has a Child Protection Policy in place, which is available on request.